After reading and loving Easy I was always going to be excited to read more by the same author. So when the chance to read Between the Lines, the first book in Tammara Webber's other series of books about teen film stars I jumped at the chance. 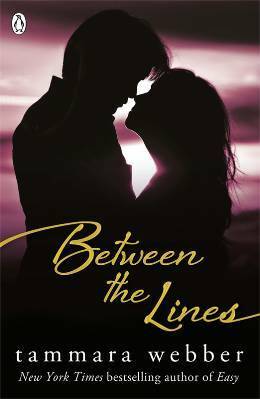 And Between the Lines was very good, a lot lighter in subject matter than Easy, but still very addictive reading and quite romantic. Between the Lines is told in a dual-perspective. We get the story told from both Reid and Emma's points of view. Reid being this mega-heartthrob film star, one whose face causes teenage girls every to scream like crazy. Reid is pretty comfortable with the paparazzi and the attention and awe that comes with it all. Where it's all a new experience for Emma, who hasn't been in the spotlight like Reid has. That is, until Reid and Emma are both cast in a modern film version of Pride and Prejudice as Mr. Darcy and Elizabeth Bennett. Suddenly, Emma has to deal with her romantic life being reported in the gossip mags and online websites and Reid has to deal with his uncomfortable emotions as he begins to have feelings for Emma. Pride and Prejudice is one of my favourite stories ever, so bonus points for including that into this book! I really thought that Between the Lines would be a fairly straight-forward love story and I found myself pleasantly surprised. Surprised not only by the love story but also the characters and the different storylines and how much I found myself really thoroughly enjoying this book. I'm really quite glad that the next two books in the series are being published here in the UK fairly quickly so that I don't have to wait too long to see how it'll end. Teen actors filming a movie is a pretty interesting subject and I was quite happy to read the little bits about filming and production that was included, especially the auditions that Emma went through and also filming certain scenes with both Reid and Graham. The teen cast members all hang out together and have parties in each other's rooms and it was fun to get to know everybody and see a glimpse into their unusual lives. Aside from Reid and Emma, the other two major characters in Between the Lines are Graham, an indie actor who singles Emma out early on. Emma and Graham seem to have this connection, but when Emma sees Graham leaving Brooke's room late at night, she's not so sure what's going on? And Brooke and Reid have an obvious history together but will that stop Reid and Emma from having an on and off-screen romance? I thought Between the Lines was a really fun book to read, one that really made me happy. It was funny and romantic and it had at least one major surprise that had me audibly gasping. Reid, Emma and Graham are all characters that I have strong feelings for and I just can't wait to read the sequel, Where You Are! I just can't imagine that I'll enjoy this. I have a notion that the characters will be a bit too pretentious. Hmmm... I did enjoy Easy though. I guess movie stars might not be everyone's thing. I loooved Easy, so I was always going to read this book. I don't think the characters are pretentious if that helps? I don't know, maybe a little? I wasn't a huge fan of the writing in Easy, but this sounds like it could be interesting. Will look into it, thanks for the great review!